I'm not ashamed to admit, I'm a bit of a cat freak. I have two cats, I love cat print anything, I just love cats. Whenever I've come across anything cat print at a reasonable price, I've snapped it up. Whilst I'm typing this I'm realising how this adds to my weirdness! Anyhow, this is going to be the first of two posts dedicated to cat prints (yep, I am a weird cat freak.). I wish I had more cat print things to post about, but it's probably a good thing I'm not going to bore all of you to death, especially cat haters! This first post includes a top I picked up in the Topshop sale online about a year ago for around a tenner. In all honesty, I saw cat print and that was it, I bought it. But when it was delivered and I tried it on I noticed that the style was interesting. It's nice and airy, scoops down slightly at the back and has a raglan sort of style going on. 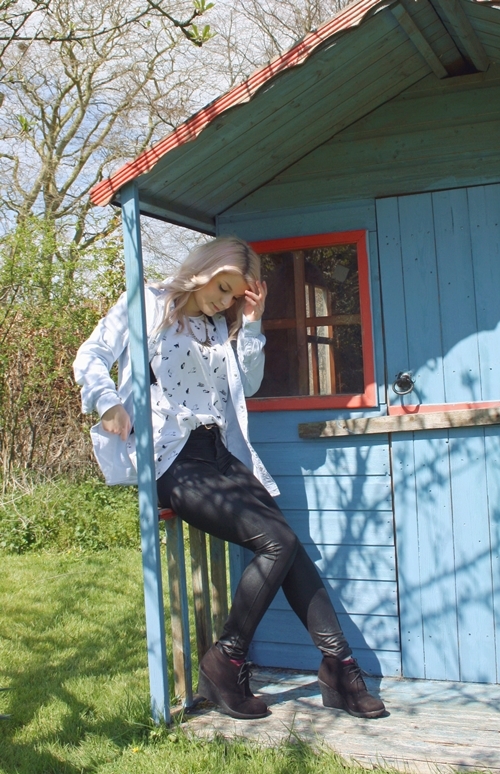 Sorry for the excessive featuring of denim shirts and these fake disco pants recently! But I think it's nice to see items reworn on blogs when we're part of a clothing culture where people are constantly buying new things (- which is great if you can afford it!). Hope you guys don't mind! Totally agree with you on the whole wearing clothes alot, i dont always like it when i see people in a new set of clothes all the time!! Shows that the item is well loved :) and i wear my denim shirt all the time coz i love it so much!! I found your blog on the #fbloggers tag and it's so amazing I had to follow <33 Great style! Love the cat print blouse.